My experience so far has been very positive at the agency. Tsering guided me by giving helpful hints and suggested ways in improving the layout of my resume so it may be more appealing to potential employers. She was amazing with the follow up after I got hired to ensure everything was going all right. I must say that they do their best to match you up with potential employers and I am confident that I will always find something suitable with the help of this agency whenever the need arise, I have a lot of faith in them. my life the very best! Thank you once again. Firstly I do think your comments are insulting and not necessary.. Secondly I absolutely disagree with all the things you’ve said. Having a job or not having one has nothing to do with the comment that’s made above. When you’re asked to show all of your documents and somebody takes copies of them and then tells you they’ll be in touch or you should check back in with them, they should have a decency to answer back peoples’ inquiries regarding the position they’ve applied for. Since everybody’s entitled to their own opinion, this is what I think. Is this comment from Ildiko? Regardless of who “L” is, these comments are false and mis-leading. Our gathering of documents are the only possible way to do our job. What is our job? The job of all at Greenhouse is to help people (job-seekers) find work. How can this be accomplished without asking for documents like a resume, references, SS# for a background check etc.? 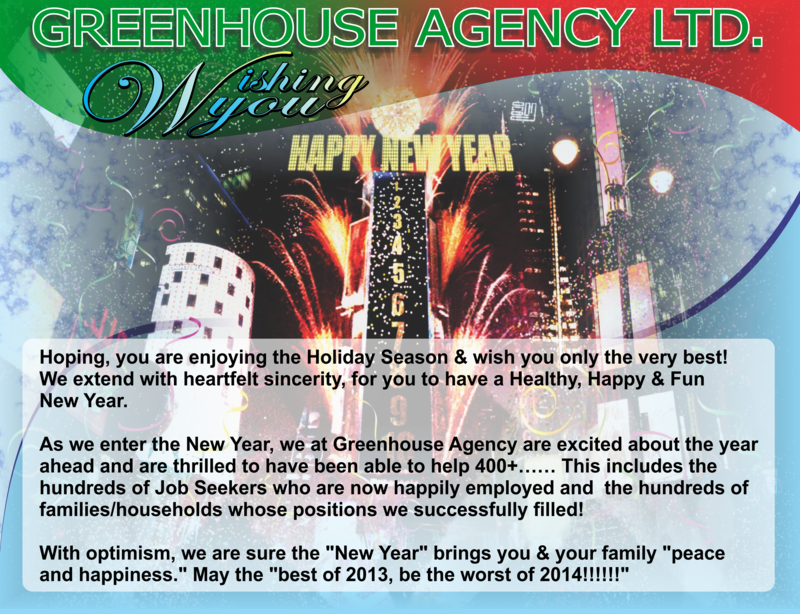 Greenhouse Agency does not force anyone to give us any data or info. As a matter of fact; Each Candidate that fills out an application when visiting our office signs (willingly) a statement which indicates clearly they give Greenhouse permission to check their references, perform a background check and fully understands Greenhouse is an “Employer Fee Paid Agency” with no fees or costs whatsoever to the Job-Seeker. Please be clear “L” as to what you are insinuating? Anyone can write with innuendo, but be fair and spell it out…. unless you know all that you are writing is a fabrication and this be the reason you pose statements as questions! I take immediate and personal offense and will address anything written which is a lie. The same goes for any person who dare lie, when such action is meant to malign the good name and reputation of Greenhouse Agency! Further, I hereby challenge you to prove or provide credible evidence Greenhouse DOES NOT use THE INFO gathered from any Candidate for the purpose of checking background, work history and assess skills for job referral. In closing, I can only assume you are either a job-seeker who has been out of work for a long time (for which you have my sincere heartfelt sympathy as I do know how tough it is to be without work), seeking to put blame on someone, or you must have worked at Greenhouse and simply couldn’t make it as a recruiter. I thank the thousands of Employers and Job-seekers who think highly of my company for reading this. You can see the unprofessionalism as soon as you walk into the office. Not only do you hear and see them treat some applicants with an attitude, but also what they do is they take the copies of all your documents, social security card etc. and then they don’t even respond to your emails. Who knows what they use all of your work history details and the copies of your documents. The Dog Came Out Of Nowhere…. and the Candidate Ran From The Interview!!! All was going as good as could be. Julie was being interviewed by Mr. & Mrs. French. The three were chatting for about 45 minutes. Mom & Dad even brought their cute 4 year old to meet and talk to Julie. All were very relaxed, with Julie going over her past experience and answering all questions asked. Mr. & Mrs. French had already begun to think about a start date. They liked Julie. They can tell she knew her job, was sincere and liked the questions she had asked. Oh well. I guess even for a nice easy 40 hour week job, taking care of one 4 year old, while Mom and Dad are at work and being paid $55,000.00 per year can make a difference when the un-expected happens during an interview. Julie had really wanted that job. The family seemed leaning to giving her a try. But what’s meant to be…..is meant to be. Can’t say I know all the details but I do know a job is a job. Which means you follow your boss’s instructions. If avoiding a “motherly nurturing relationship” is the wish of the Mom who’s most probably paying a generous salary?……So be it. I’m in the Domestic/Household Staffing Biz for 30+ years. I’ve seen it all. From what has become apparent, a Nanny working for Mariah must always be sure to constantly remind her/his charges: “Mommy Loves You and will be home very soon.” “I am not your Mommy I work for your family and my job is to take care of you.” “Your Mommy works very hard and is a great Mommy who loves you!”.. I believe a professional, smart, talented Nanny can do their job and (AT THE SAME TIME) take steps to avoid the “little ones” they care for, from beginning to reach for them or look at them as their Mommy. Again, if this is what the Boss wants…then it’s just like any other work place. As long as your being treated fairly, you be sure you understand your Boss’s wishes and perform to your Boss’s expectations. In a perfect world, there is a perfect job waiting for you …and just when you need it. Sadly, we don’t live in a perfect world, at least not all of us. We take positions for different reasons and needless to say these choices might lead us on paths of dormant potentials. 4 years ago I started a job with a very simple, straight forwarding work expectation. It wasn’t exactly what I wanted to do on a long run. As the years went by, I started thinking: If ever I get an opportunity to do what I really want to do…would this transition lead to ultimate happiness? I came to a realization that happiness is in my own hand and decided that I’ll make the most out of what I have. After all, why should I chase my dream job which may not be as perfect as I hope? So, I slowly started implementing my knowledge and passion into my work routine. Now (as the years went by) we have established a weekly routine of cooking projects. We look at old recipes or search for a new idea online. We spy for new ingredients on the market – and try to learn about them. We manage our time and pace our project. We integrate humor and create lifetime memories. At last we learn to take pride in our work and …repeat. HAPPY NEW YEAR – TO ALL OUR FRIENDS!!! DRIVER / CHAUFFEUR Needed ASAP….. NYC /// w Family Experience!!!!! No O/T or Health, just a good job paying a decent salary.